First Virtual Malvern Panalytical MicroCal ITC User Meeting – February 28th, 12-3pm ET! 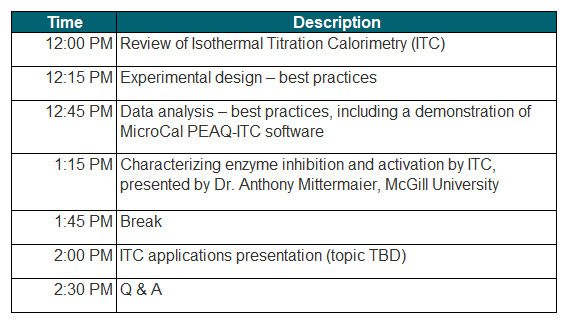 Following our recent successful virtual Zetasizer User meeting back in October 2018, we are pleased to announce the first MicroCal Isothermal Titration (ITC) Virtual User Meeting – Thursday, February 28, 2019, 12:00 to 3:00 PM Eastern Time (ET). This initiative is to foster the exchange of knowledge and experience between our applications support group and the researchers that regularly use a MicroCal ITC system (VP-ITC, and PEAQ-ITC). Presentations will be given by Malvern Panalytical ITC experts and researchers from within the ITC community. 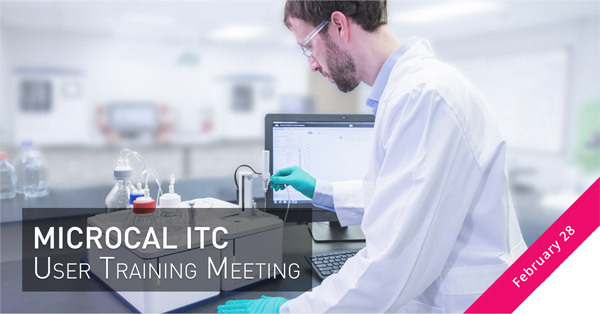 The MicroCal ITC community is invited to submit specific questions (including ITC data) in advance of the virtual user meeting; we will be selecting from these questions to answer during the live event. Email me your questions by February 26, 2019. This virtual user meeting will be live-streamed and is limited to 3 hours. The preliminary agenda is below; we will publish the final agenda prior to the event, to allow attendees to tune in to specific sessions. The meeting will be recorded for the benefit of those not able to join live, so please register if you would like access to this content. Please consider joining us! – we plan on making virtual user meetings regular events.